We must remember that no other surface in a building takes more abuse than floors, regardless of the type of building, be it industrial or commercial. While a bare concrete floor can withstand tremendous weight and pressure, it is relatively porous and susceptibility to significant damage when left untreated or uncoated. If exposed to regular foot traffic or the demands of a commercial environment, concrete will readily absorb dirt, chemicals, oils and other spillages. This often results in stains, cracks and abrasions that can make the floor impossible to clean and unattractive in appearance. Hence all concrete floors need some sort of protection regardless of where they are located. Over the last few years, the protection of concrete floors has gone from essentially nothing to a fairly sophisticated process of some type of protective coating or surfacing. The main purpose is to provide protection to the slab from deterioration or contamination or to provide some added benefits such as aesthetics, wear, non skid, chemical resistance, ease of maintenance and different other properties. How to choose the protective material for concrete floor in different conditions? Typical coatings that are mostly used for concrete floors include polyurethane & epoxy. 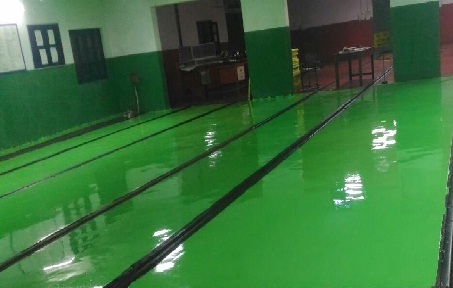 Polyurethane (PU) flooring has some added advantages over epoxy flooring which are as follows. 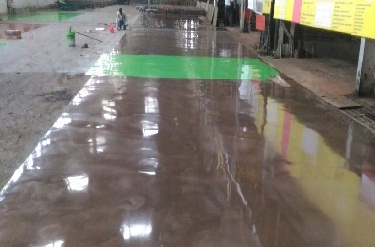 It is self leveling underlayment of thickness 2mm to 5mm for PU flooring which is having the following advantages.